Twice I’ve had the thrill of crossing the Spanish-French border under European Union law. Once at Hendaye, once at Portbou. There are no border guards now. No papers to show. You just go on through. If you’ve read and heard about the history of border crossings there, it’s like undercounting stair steps in the dark: you reach out a toe, feeling for that one more step down, and instead you find bizarrely solid ground. Without meaning to suggest equivalence, I had a distant echo of that feeling today at the gate shown here. 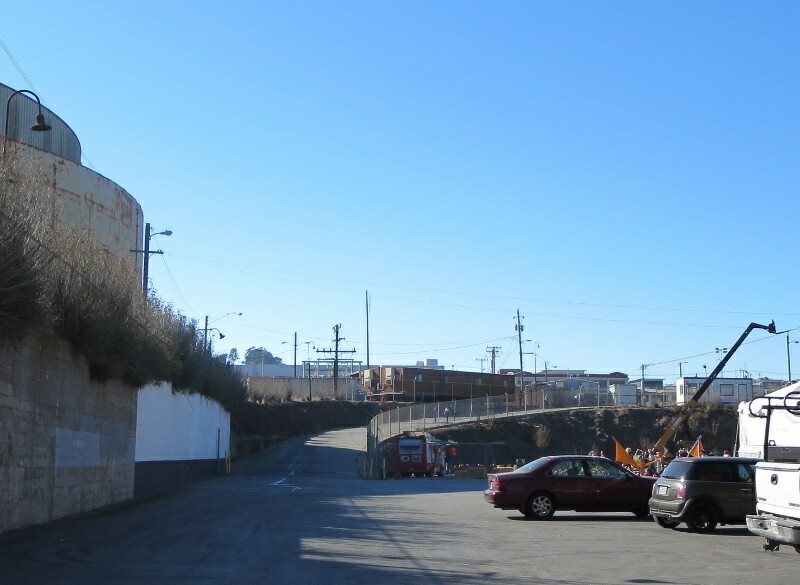 It was, until recently, the gate to San Francisco’s main city car impound yard. For the last ten years it was run by the Auto Return company. Before then it was run by the legendary City Tow. 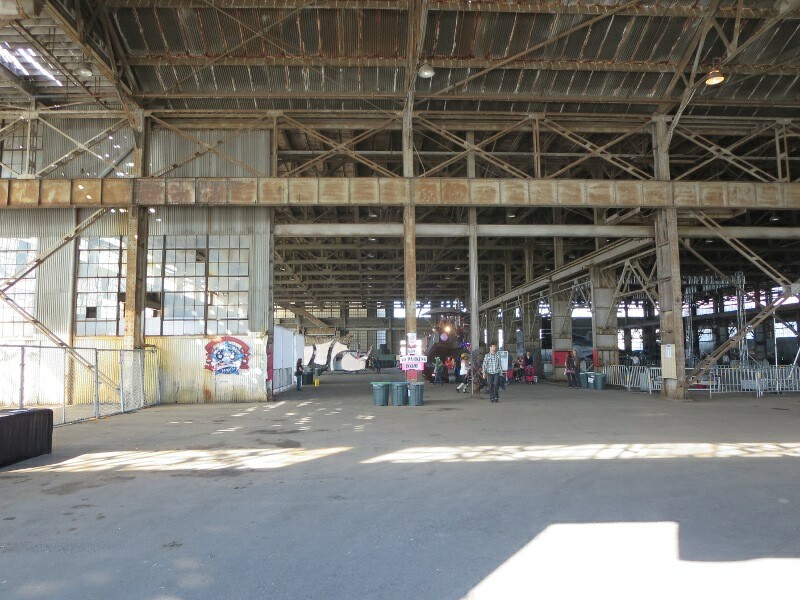 An earlier post here tells some stories about ghosts that, metaphorically speaking, haunt Pier 70. Out of those stories, the ones I know best had to do with this gate. For too many poor people who lived in vehicles in San Francisco, this was where their homes were stored after towng and then, too often, crushed. Today it was possible simply to walk through. No questions, no papers. It’s no longer the tow yard. 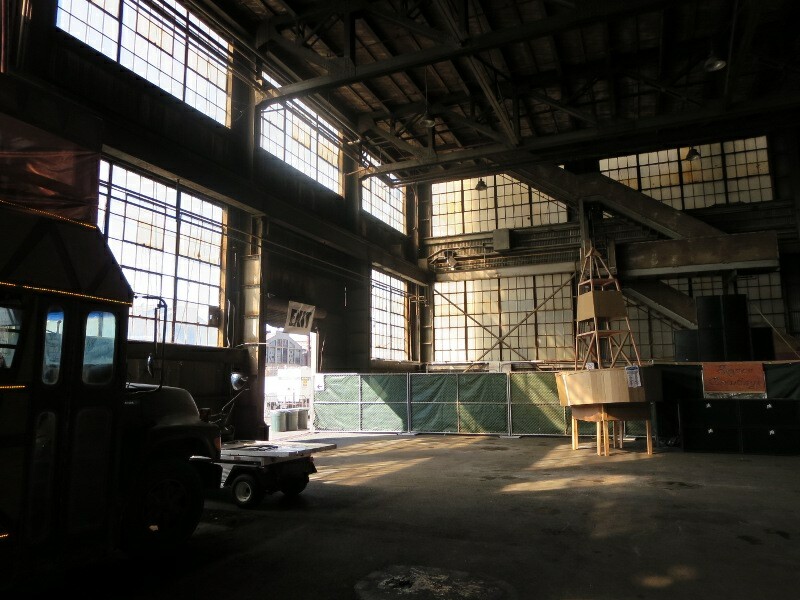 It’s a property being prepared for redevelopment, in part by assigning it a more manageable identity as simply the former Union Iron Works plant. 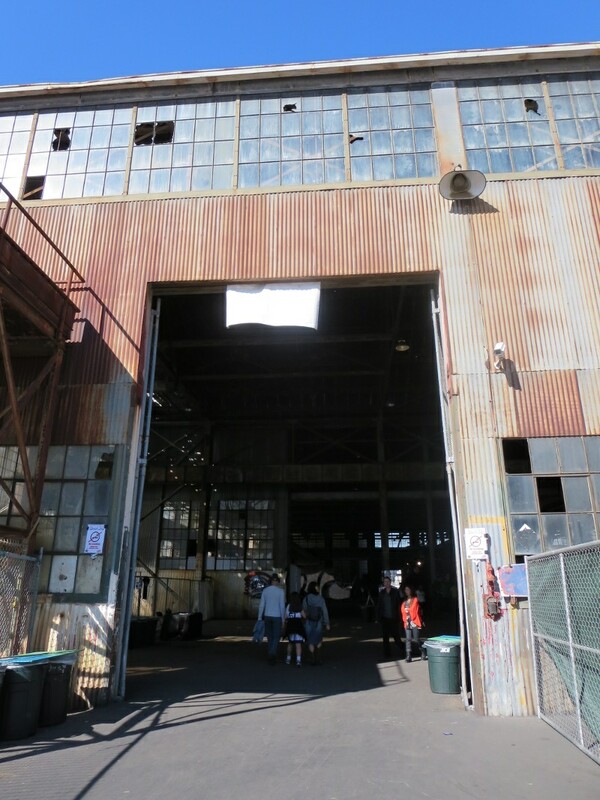 Today Pier 70 was hosting a family Halloween event combined with a “sneak peek” at the art creations for this evening’s “Ghost Ship” dance party event. For the afternoon event, admission was free. Unexpectedly to me, the event had the effect of a healing ceremony. The tow yard had been a hypermasculine environment where painful dispossessions happened. 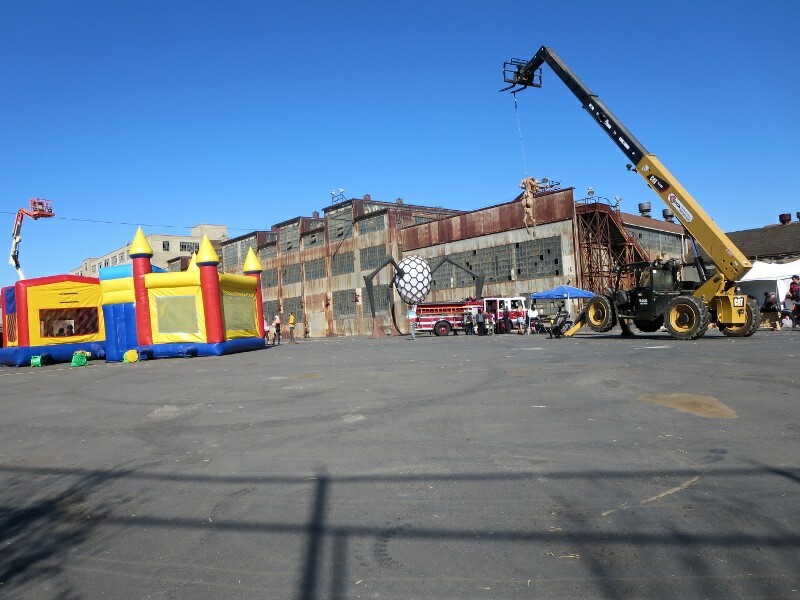 Now the developer had begun to soften the place by hosting an event there for children. It had a healing effect simply to see families receive and accept the assurance that children could be safe there, that none would make them afraid. Or rather, that “scary” Halloween decorations and costumes, brought to the place for a ritual Halloween celebration, might frighten children for a moment or two at most — that the “scary” genuinely belonging to the place was now becoming safely encapsulated in quotation marks, was on its way into the manageable realm of fable. I take this all a bit personally because I used to be a volunteer advocate, mostly during the City Tow era, for people who lived in RVs and vans and trucks and cars. Because of San Francisco’s campaign to gentrify its eastern waterfront, these wheeled homes were towed often, mainly by the book but often for tiny offenses that wouldn’t have caused trouble for sleeker vehicles in less “transitional” neighborhoods. Towing is only merely a nuisance if you can afford to redeem your car the same day and you are allowed to do so. It is a life-changing devastating dispossession if, for one reason or another, you can’t get your vehicle back and in it is everything you own. This gate is where a gruff security man would open the gate just slightly to look at your pass. In the City Tow era, at least, it felt more than a little bit Soviet. If you were lucky what you had to show the guard was a voucher. A voucher meant you had won your informal hearing at the police tow desk at 850 Bryant downtown, and/or you had paid required storage fees at the privately run tow company desk nearby. That meant you had the right to walk down the earthen ramp behind this gate, and after checking your vehicle for damage or theft, to start up your vehicle — if it would start — and drive it back up the ramp to freedom. If you were less lucky, either you couldn’t afford the tow fees or the police refused to release your vehicle for any price, but at least you had been authorized to approach the gate with a permission slip to enter. It would allow you to check your vehicle’s condition (the condition was not always as last seen) and to recover property from inside of it (supposing said property was still there). Sometimes vehicle owners came here with friends’ cars, or with whatever kind of handtruck or cart they could bring, to cart away everything they could of all they owned. Today all the vehicles were gone. 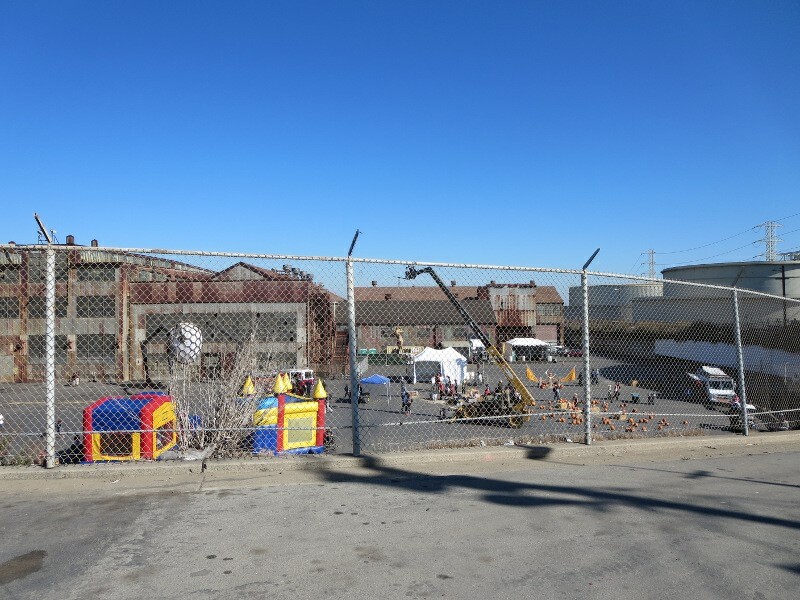 Today, in their place, J&I entered the gate and saw, in the former car yard below, a children’s Halloween carnival. Tough to believe: a bouncy castle. Pumpkins. A hay maze. Among them also, artily macabre Halloween decorations for the grownups’ $50-a-head night-time party. 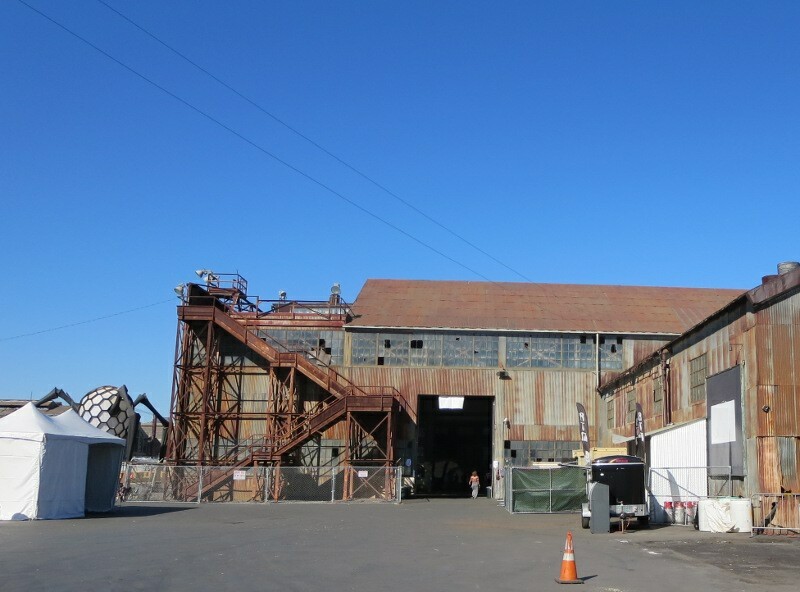 The monstrous barn at the back of the lot, Building 12, was formerly used for indoor vehicle storage. In the City Tow days at least, if a vehicle had been put in there it probably wasn’t going anywhere else any time soon. Probably it had been ten years since I’d been in through that big open doorway. Before, you needed a guard’s permission to go in. Today it stood unguarded. “Lasciate ogni speranza” no more. Just a simple ruin, already easier to see in terms of its older history as a factory floor, already losing its capacity to strike dread. This next picture, emphasizing the beams and rafters, is most like the storage barn as it occupied my mind’s eye. Of course before it was full of cars and vans and RVs and miscellaneous scavenged junk. Very full. 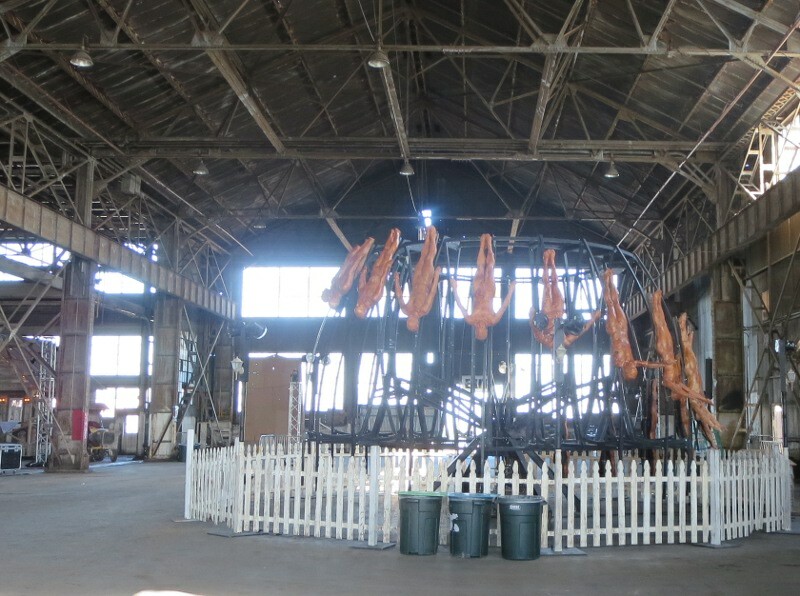 The artistic variation on a carousel shown below was genuinely, disturbingly macabre. But, again, when we tell stories or make art about the fictitiously horrifying, isn’t that how we get a handle on the genuinely dreadful? 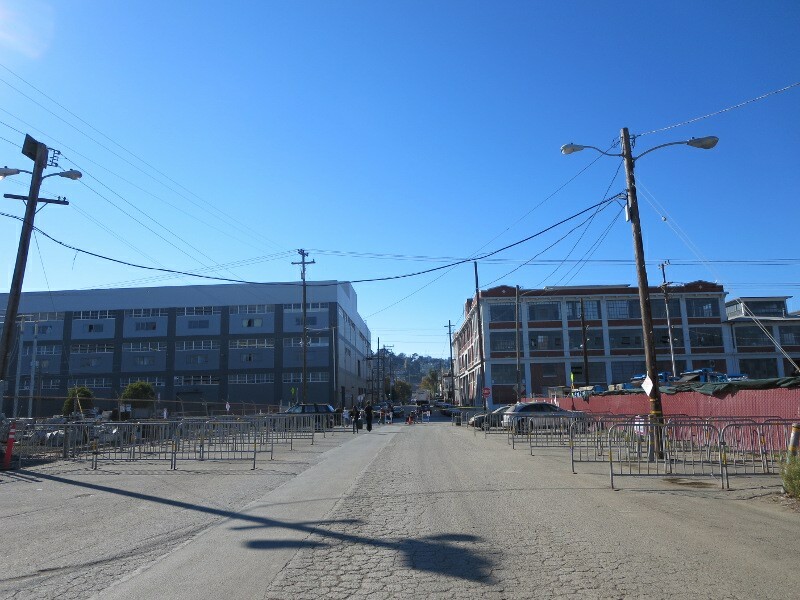 Ironies: a small family house and a steel school bus, both characteristic of the adjacent Dogpatch neighborhood before its redevelopment, both repurposed as art installations, both here. The next picture below shows the northwest corner of the barn — that’s the back left as you would have entered before, after getting permission at the old lower-level guard shack. I wrote mistakenly earlier that the cars inside the barn were simply lined up as in a parking lot. A conversation since then has refreshed my memory. Actually, as you went back in the barn, the vehicles got more crowded together. Removing a car or RV from the back of the barn became correspondingly difficult. And unlikely. So that made a big difference, today, to see the back of the barn emptied out and opened up. In preparation for the night-time dance event, huge signs reading “EXIT” had been posted over all of the barn’s big open doors. Those were wonderful signs to see. 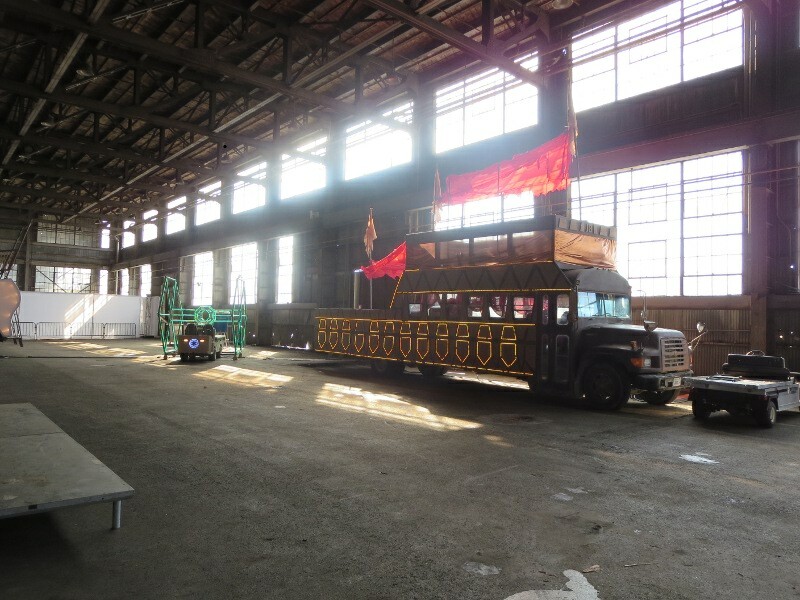 I genuinely felt lighter seeing the remembered Barn Of Vehicular Doom ventilated and put to use for a ritual celebration that purposefully made light of scary things. Injustices are still happening to people living in vehicles of course, but not here. This particular place has begun to heal. 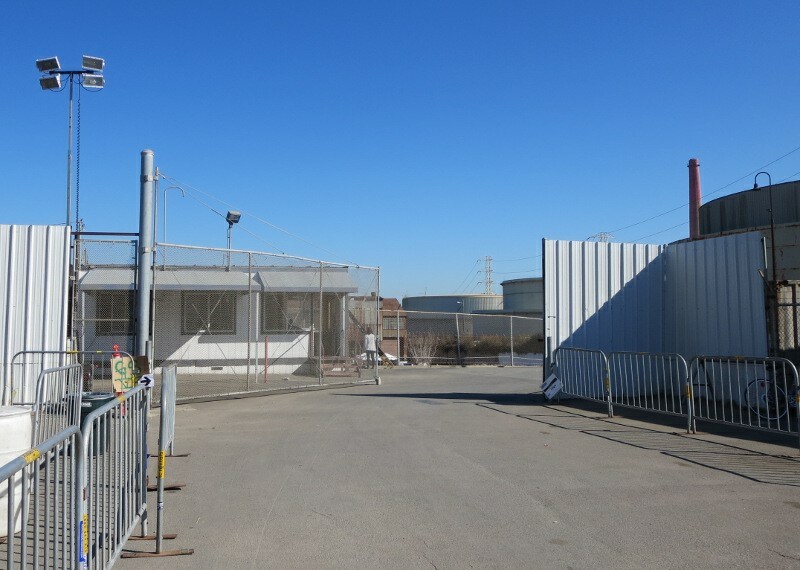 I felt relieved to be walking back up that ramp, and going freely back out that gate onto 22nd Street, and not leaving anything behind. Not on this day. Not at this place. 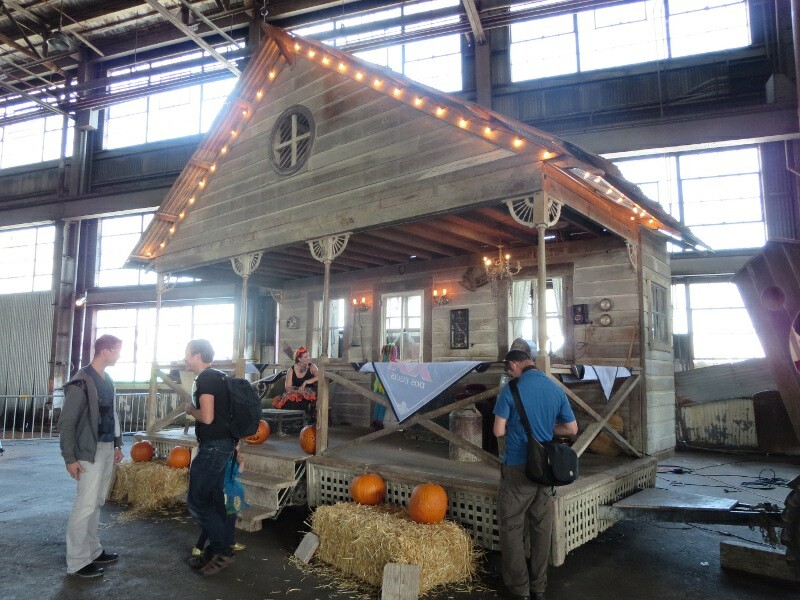 This entry was posted in Architectural legacies, Housing dysmorphia, Public Space, San Francisco on October 26, 2013 by Martha Bridegam.